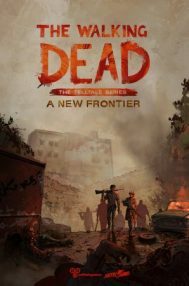 While many regard Telltale as perhaps the best developer and publisher of narrative-driven games that push the “choose your own adventure” model, it’s no secret that their handling of Skybound’s graphic novel, The Walking Dead, is what really drove them to this well regarded prominence. 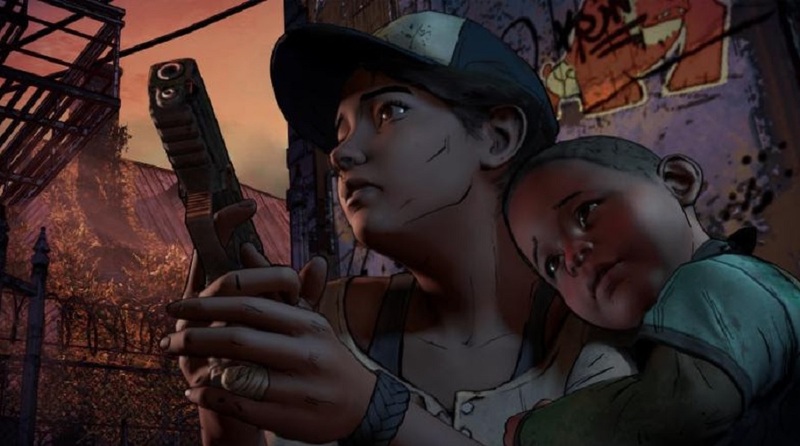 The series introduced us to Clementine, a little girl who stayed home alone when The Walking Dead‘s apocalypse unfolded, and over two seasons (ten episodes) we watched her grow from a helpless little girl to a strong-minded preteen growing up way too fast thanks to the experiences she’s had. 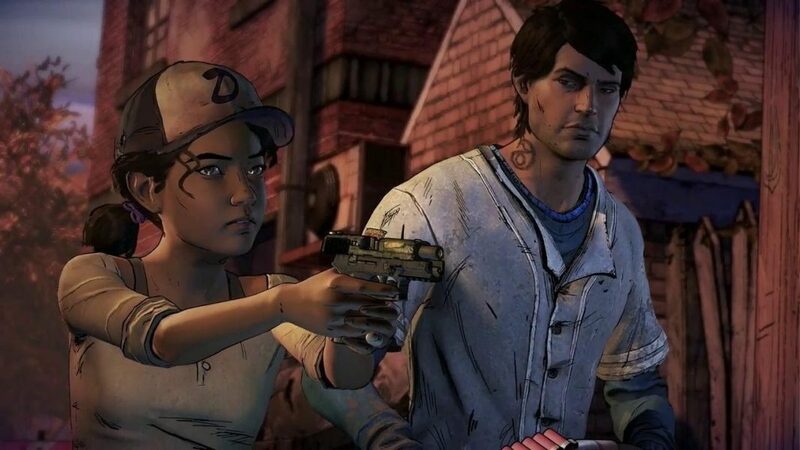 Though we no longer have complete control of her in the game series’ fourth season, she remains a strong central character for the series to build its plot around, and Telltale is doing a great job despite the problems that have plagued the series since day one. Titled A New Frontier, Telltale is back with the third season in the superb Walking Dead series. If it’s your first time getting into the series, while we easily recommend that you go back and play them (I mean come on, it’s awesome and each episode is rarely ever longer than an hour and a half), the game does offer a quiz that sort of summarizes the events of the first two games to shape the overall attitude of Clementine, the central character in both of the game’s previous seasons. The story begins minutes before the zombie apocalypse by giving us some background on Javier and his family. Javier is an athlete rarely ever home, and when he’s asked to be around for his father’s final moments in his death bed, Javi arrives too late, much to the dismay of his older brother David who seems to always have been jealous of his younger brother’s actions despite having a family of his own and serving in the military. To further complicate things, Javier has a great relationship with David’s kids and his wife. So when his dad dies, he “turns,” and all hell breaks loose. Fast forward to the way things are in The Walking Dead‘s world now. David is out of the picture, while Javier is left to fend for himself and David’s family with a herd of zombies a stonesthrow away. With Clementine seemingly no longer the main character, that’s about as good a question as any. While I completely don’t mind using a new character in The Walking Dead universe–I mean, we used a bunch of characters in 100 Days, and then another new one entirely in Michonne–at first, it’s a bit hard to care for Javier’s character. First of all, the kid’s aren’t his. Secondly, he’s building sexual tension with his jealous brother’s wife? If you’re still not used to seeing Clementine with a gun, here’s another image of it. Anyway, bad things happen when Javier’s group comes across a camp with supplies that not surprisingly has already been claimed by another group–one that’s armed to the teeth. 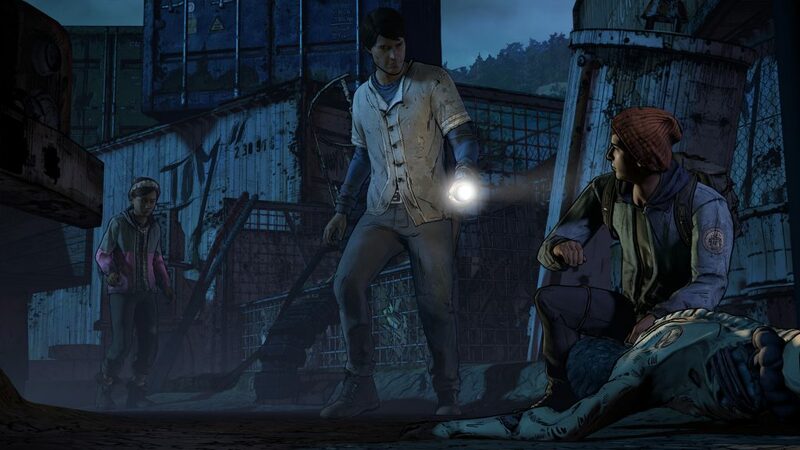 Eventually, Javier gets separated from the group before he’s rescued by none other than Clementine. This is about halfway through the first episode where the action really picks up. As anybody who’s played before can tell, Clementine has done some growing, and if you thought she was awesome in Season 2, she’s a straight up savage A New Frontier. She’s now so much of a badass that it’s now her weakness as a person. It’s no secret that Clementine’s been through some stuff, and the game gives us a bit of a background as to what happened to her leading up to her appearance in the game, so it’s a solid way to give players some perspective as the scenes will differ based on your decisions in previous games. The problems lie in issues that have constantly plagued Telltale’s games in the past. For the most part, the finer visual details are definitely an upgrade, but its overall polish leaves much to be desired. Even at this point in the generation, frame rate remains to be an issue, as I encountered annoying lag and stutter during key moments. There were even some frames that needlessly repeated during rather pivotal points in the story, which makes you wonder if people actually report these issues in Telltale’s playtests, or whether or not the developers even try to fix them. I didn’t plan on overdoing it with the criticism of the gameplay, because we’ve been getting this kind of game for years, and it’s become pretty clear over the years that the bread and butter of this franchise, or even this genre, is the narrative in combination with excellent acting. That said, it doesn’t surprise me one bit how great of a job Melissa Hutchison (Clementine) and everybody else does vocally, and the twists and turns in both these first two episodes were actually not 100 percent predictable. Baby A.J. appears in Clementine’s flashbacks, but we don’t know whether he’s still around. Still, I do have a bone to pick with the overall gameplay. It’s clunky at best. When you first take control and have Javier walk around, it just doesn’t feel all that natural, and the inconsistent frame rate makes changes in the scenery also feel like bad camera work. In addition to this, most of the QTE in the first episode didn’t even map the button work properly. There were multiple times where I was prompted to hit X when I hit B instead, and the animations still registered. I honestly wouldn’t have been surprised if you can just go through the first episode by constantly tapping the X button. Episode 2 seemed to have corrected the problem for the most part, but there were a couple times two buttons showed up on the screen at the same time, causing confusing deaths that definitely weren’t intentional. It’s worth noting that I played Episode 1 before sleeping and Episode 2 as I woke up, so far all we know Telltale must’ve submitted an asset bundle to make control fixes, but who knows? If you can get through the game’s typical problems, which is generally easy to do because the story remains as engaging as ever with new characters and this dark version of Clemetine, there’s a lot to like in this new season of The Walking Dead. With the TV show ratings seeing record lows, I don’t know what to expect with the game, but to me, this has always been the definitive Walking Dead experience. The stakes continue to be raised as to what’s appropriate with the game’s drama, and I can’t help but be enveloped in the world that these first two episodes have presented.